Both Brut and Demi-sec, wines that should be better known! Located southwest of Champagne, Vouvray makes some wonderful wines, and some are absolutely world class such as many by Huet and Foreau. I've had some 50s and 60s from Huet that still rock in the 2010s so they can be extremely long lived as well! Vouvray is in the Loire Valley, an area I've been fortunate to have visited a couple of times recently. Other world class wines in the Loire Valley include Quarts de Chaume (sweet wines, many of which will outlive us) and Bonnezeaux (sweet as well). The star of The Loire Valley is the Chenin Blanc grape, which can produce wines ranging from very dry to very sweet. Chenin Blanc (known locally as "Pineau de la Loire") is nearly the only grape grown in Vouvray, although Arbois, a rather obscure grape, is also allowed yet very rare. I've never encountered it. Vouvray is not known primarily for sparkling wines, although a fair amount of the wine made in Vouvray is sparkling. There are several producers including Foreau, Champalou, Domaine de la Racauderie, and Château Moncontour. Sometimes you might hear them referred to Loire Valley Sparkling Wine. Montlouis, right across the Loire River, also makes some very nice Chenin Blanc sparklers. In the Loire, the wines are referred to as "Fines Bulles" meaning "Fine Bubbles." The wines are made the same way as Champagne, the so called "Méthode Traditionelle" where the secondary fermentation, the one that creates the bubbles, is done in the bottle. There are two types of Fines Bulles, Vouvray Mousseux and Vouvray Pétillant. Pétillant tends to be lighter and with fewer bubbles - it is bottled under less pressure than Mousseax. Sparkling Vouvray might be labeled Mousseaux, Pétillant. or neither, and to add to the confusion, there supposedly is no legal difference under French law. They are however both delicious. 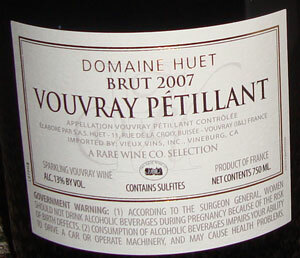 Champalou makes popular and somewhat widely available Vouvrays, including sparkling. Made by a husband and wife team, they have 21 hectares of vines, 3.5 dedicated to sparkling wine with an average vine age of 20 years. They pick the grapes in the early morning and vinify in stainless steel tanks. I picked up the bottle below for about US$20. An absolute steal - I paid US$25 a bottle! Thanks to The Rare Wine Company for importing this! From the famous Domain Huet, with grapes from all three of their iconic vineyards: Le Haut Lieu, Le Mont and Clos du Bourg. The nose has surprisingly fresh orange blossoms with an undercurrent of apple and some peach. Lighter on the palate than expected, but no lightweight. Orange and fruits. Almost apricots and other dried fruits. Lovely. Intriguing. Very clean and crisp! 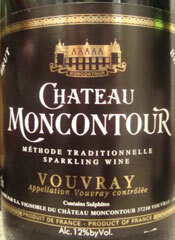 Tasting Note: Moncontour Brut Sparkling Vouvray - March, 2013, rated B. I like it. Nose has melon, some sweet orange, touch of apple. Minerals, lemon/lime, orange without the citric acid, and white fruits on the palate. Round, warm, and friendly. Not overly complex but fun. At about US$17, it's a good deal. They also make a Demi-Sec and Brut Rose at around the same price. 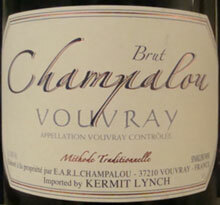 Tasting Note: Champalou Brut Sparkling Vouvray - January, 2013, rated B+ and a lovely wine! The taste is golden apple, long and smooth, with orange citrus around the edges of the tongue. Minerals as it warms. Smooth and gentle, a very warm and giving wine and I'll buy more!